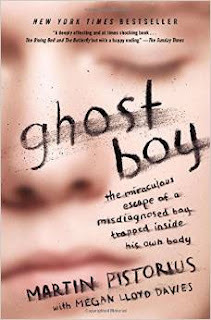 Martin Pistorius was an active little boy, until the day his body began to inexplicably deteriorate. Within 18 months, Martin was completely non-responsive, spending his days strapped into his wheelchair, staring into nothingness. Martin provides us with such an immense insight into the value of life, one that doctors washed their hands of, one doctors said should be left to die, a life people thought worthless, a life many objectified and abused. Just imagine being fully cognizant, inside your own body, but unable to communicate in any manner, no sounds, no movements, nothing, a "vegetable". Martin knew God was real and with him in the darkness just as he knew God knew he, Martin, was real. With God's presence, he persevered until one day a caregiver convinced others that there was more to Martin than they all thought. An inspiring story of love and the preciousness of all life. A must read! !